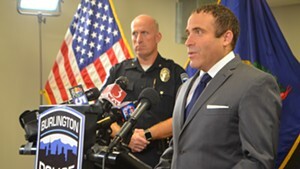 Brandon del Pozo's remarkable résumé is what convinced a selection committee to choose him as Burlington's next police chief. 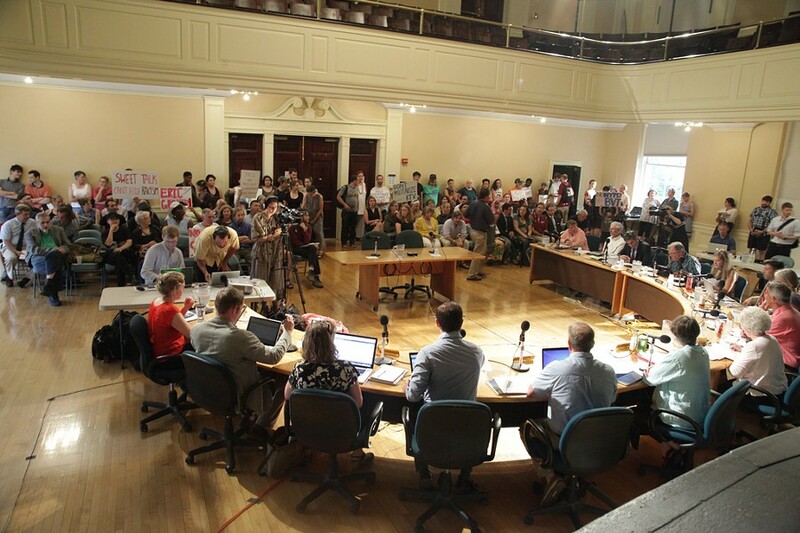 Outcry over the same CV is also what brought about 130 people to Monday's Burlington City Council meeting to argue whether the panel should affirm the Dartmouth College-educated, New York City Police Department alum as the Queen City's top cop. Some in the audience linked del Pozo to New York's systematic profiling of Muslims after 9/11, its discredited stop-question-and-frisk arrest tactics and shootings of unarmed minorities. They called on the council to delay voting to give the public more time to examine del Pozo's background. "The vilification that you hear does not match the man," former police chief Michael Schirling countered during the heated discussion about his replacement, which went on for more than three hours. The councilors agreed with Schirling, who retired last month. Even those who had expressed public concern about the new chief decided to back him. In the end, the council voted 11-0, with one abstention, to stand by "the man." Del Pozo's months-long vetting process was anything but standard issue. The team of interviewers that reviewed the police chief candidates included Mayor Miro Weinberger, cops, minorities and city councilors of all political stripes. Virtually everyone involved in the hiring process came away using the same word to describe del Pozo: "impressive." The 1996 Dartmouth graduate, a doctoral candidate with three master's degrees, had done his homework. He knew the city has five main entry points, that its officers had fired their weapons twice in the last 15 years. He'd read a 2010 study on the force's traffic stops back when it came out. He engaged in lively philosophical discussions about how officers should be engaged in every city neighborhood. He offered ideas for mentoring recruits to attract a more diverse squad. Del Pozo was also personable. He didn't just talk; he listened. He sold the committee on his fondness for Burlington, which took root while he trained at the U.S. Army Mountain Warfare School in Jericho as a member of the Army National Guard. If hired, he said, he planned to live in the heart of the city with his wife and two sons, ages 7 and 3. He'd hear the college students as they traipse downtown. He'd bike to work. But what really sold Weinberger and others involved in the search process was del Pozo's street-cop experience. The 40-year-old spent 18 years with the NYPD, starting as a patrol officer and later commanding two New York precincts. He served overseas, reporting back to New York on terrorist attacks from Jordan, and more recently worked on special projects as a deputy inspector. 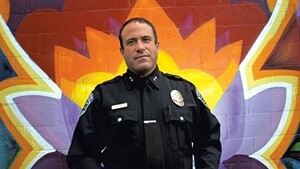 "I don't know many people in policing with his educational background and police command experience," Weinberger said. Those who selected del Pozo never anticipated the wave of criticism that would follow. But in the digital era, anyone can do a Google search. Community members found information online that left them wondering whether the search team had done a sufficiently thorough job. In particular, they questioned a grad school paper del Pozo published in 2001 that suggested racial profiling had a place in police work. His extensive NYPD résumé drove some to conclude that he was involved in the department's Muslim surveillance tactics, for which the city is about to settle a lawsuit with the American Civil Liberties Union. Abdullah Sall, a Burlington Muslim who used to live in New York, accused him of anti-Muslim prejudice, directly connecting him to NYPD's post-9/11 profiling of Muslims. "We should not be looking to take expertise from the problematic culture of the NYPD," Sall told city councilors Monday night. "The chief of police should always be an established community member." Del Pozo's response: "I had absolutely no part in the surveillance of any individual." In interviews before the council meeting, del Pozo denounced the racial profiling and Muslim community infiltration tactics the NYPD is accused of using. "The infiltration of mosques had the effect of destroying the trust of members of that community," del Pozo told Seven Days. Of racial profiling in general, he said, "It's bad police work. It alienates citizens. It's ethically wrong and it's illegal." He called the practice known as stop-question-and-frisk "overdone." Current and former coworkers — reached through sources independent of del Pozo — along with a former professor and reporters who've covered the NYPD agreed that there's no evidence to pair any of those policies with del Pozo. NYPD Lt. Jim Griffin, who has long worked with del Pozo, described the new chief as a well-rounded person whose blend of academics, military, police and outdoor experience really is as rich as it sounds. "He's comfortable in every community," Griffin said. "He's very personable. He can talk to everyone from the most highly educated to the child going to grammar school." The son of a Jewish mother and a Cuban immigrant father who grew up in Brooklyn, del Pozo majored in philosophy at Dartmouth, joined ROTC and the Army National Guard. His first full-time job after college was as a patrol officer back home in Brooklyn. He was never a typical rookie cop. He snared a master's in public administration from the John F. Kennedy School of Government at Harvard, then another in criminal justice at City University of New York-John Jay College of Criminal Justice and a third in philosophy at CUNY, where he is still working on a doctorate in philosophy. 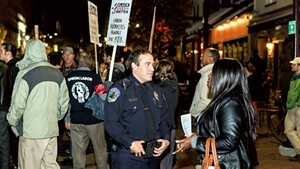 For a police ethics class, del Pozo wrote the 36-page academic paper on racial profiling that is now raising eyebrows. Search committee members, including Weinberger, said they were unaware of the paper until after del Pozo won the job. "At certain times, not using racial profiling might be to neglect certain moral duties," del Pozo wrote. "It should remain in the police officer's arsenal of weapons against crime, but be recognized as ungainly, and to be brandished only for compelling reasons." John Kleinig, his professor at CUNY, said he recommended that del Pozo publish the paper in an Australian law journal. Kleinig defended it as a well-rounded academic endeavor. "Brandon has no racist tendencies, and it surprises me that people should have thought otherwise," he said. "The paper itself is basically an exploration of whether race/skin color might ever enter into a calculation for police investigative purposes and, if so, how and when." Kleinig said del Pozo was a standout student. "I don't think I've ever had another police ethics student as good as Brandon," he said. "To be frank with you, Burlington is very lucky to have someone as competent as Brandon on their list." Alongside his bookwork, del Pozo also worked as a beat cop. On September 11, 2001, he was on patrol in Flatbush when he was dispatched to the World Trade Center after the first plane hit. He arrived just after the second plane struck and the buildings were starting to collapse. He was assigned to help evacuate the New York Stock Exchange. He said he learned that day, "There's certain things you can never anticipate." In the years since, he has held 13 other positions within the NYPD, according to his résumé. Aside from precinct commander, del Pozo's job titles are vague enough to make it hard for the average person to know exactly what he did: intelligence, internal affairs, special projects and, most recently, strategic initiatives. Some who have been scouring the internet for information on del Pozo concluded that those jobs involved some of NYPD's worst policing tactics. They struggled to find solid evidence, however. Adam Goldman, a former Associated Press reporter now at the Washington Post, co-authored a Pulitzer Prize-winning series and a book called Enemies Within, about the NYPD's then-secret unit that routinely infiltrated mosques and other sites after 9/11. He said there's no indication del Pozo worked for that unit or was involved in the systematic profiling of Muslims. Del Pozo said people who argue otherwise are making assumptions. "I was halfway around the world, working with the Jordanian police, which is not an espionage unit," he said. From 2005 to 2007, the NYPD dispatched del Pozo to Jordan to open a liaison office as part of the intelligence division. It was one of 11 countries in which the NYPD posted officers to report back information about terrorist attacks that might be helpful to New York. Del Pozo learned Arabic. In his first week, there was a suicide bombing in Jordan. The next year, he was dispatched to Mumbai in the aftermath of a deadly rail attack. Mitchell Silber, a civilian who analyzed the information del Pozo and others sent back, said del Pozo reached those scenes before other U.S. intelligence officers and reported "invaluable" information, which he said he could not disclose. Del Pozo said he mostly collected information about how terrorists bypassed hotel or train security, how they obtained explosives and what makes cities vulnerable to attack. That information helped New York and other U.S. cities beef up security. He said he also learned to appreciate Muslim culture from his time in the Middle East. In 2013, he was assigned to "special projects" in the police chief's office, another title that raised questions among critics. One of those special projects, he said, was Twitter. He helped institute its widespread use in the NYPD, the goal of which was to "change the shape of the way we relate to communities." Del Pozo acknowledged that putting the world's largest police department on Twitter posed challenges and required modifications. Detractors hijacked hashtags. Users required training and guidelines for tweets. Del Pozo's most recent role had him back working with Griffin on "strategic initiatives" in the deputy commissioner's office. Their work involves analyzing New York police data on violent crimes to find connections, Griffin said. In just three months, they've been able find patterns more quickly than in the past, allowing police to prevent robberies and shootings, he said. Griffin said when he heard del Pozo was applying for the Burlington chief's job, "I actually tried to talk him out of it. I think it's a loss for the NYPD." Del Pozo was among nearly 30 applicants for the chief's job, Weinberger said. The field included two internal candidates: Lt. Matt Sullivan and Lt. Shawn Burke. Over the course of several months, the number was winnowed to 20, then to eight semi-finalists and finally to four finalists: Burke, del Pozo and two other out-of-staters. Del Pozo stood out from the start, search committee members said. "After the first interview, which was by Skype, we were like, 'He seems really great. Can he possibly be that great?' I was honestly nervous about the second interview," said Sarah Kenney, city police commission chair who has spent years advocating for domestic violence victims. The second interview, in person, was even better, Kenney said: "He struck me as a really good listener. He engaged the committee in a dialogue, which I value really highly." Cpl. Dave Clements, the president of the Burlington Police Officers' Association who was also on the search committee, said for him it was "a dead heat" between Burke and del Pozo. Clements said he has a lot of respect for Burke but del Pozo's experience was hard to beat. "He has experience where he works that you couldn't gain here," Clements said. Kyle Dodson, an African American Burlington school commissioner who was on the search committee, confirmed everything del Pozo said during interviews suggested he was sensitive to minorities. When Dodson later learned of del Pozo's racial profiling paper, he called it "unfortunate," but was impressed when del Pozo called him to talk about it. Monday night, as critics in the audience hissed their discontent, Dodson told the council his support for del Pozo was unwavering. "I think if we let him get away, we may regret it," Dodson said. A few hours later, the council formally agreed. 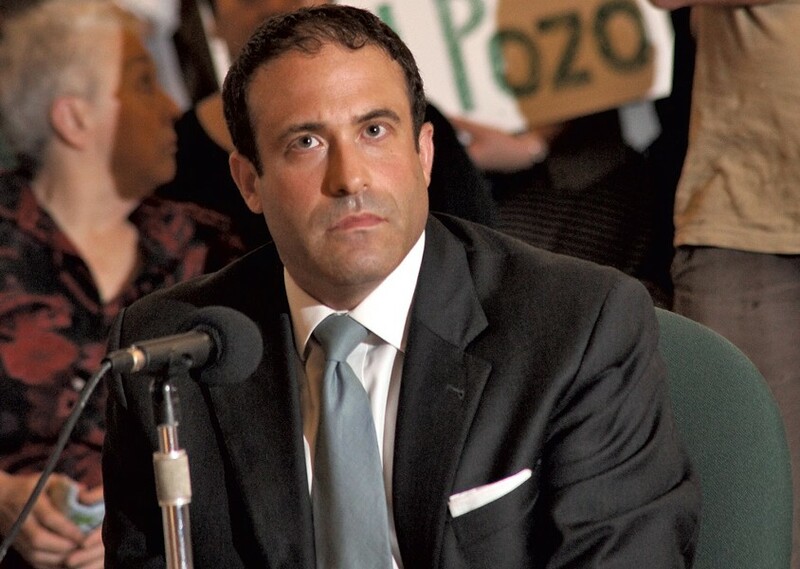 After the vote, del Pozo turned to critics in the audience. "It's an honor to be your chief," he said. Del Pozo starts work on September 1 for an annual salary of $114,363.